Extend the Distance Between Your USB 2.0 Devices to 30ft. The USB2HAB30AC 30-foot USB A to B cable features one USB type-A (male) connector and one USB type-B (male) connector, providing a high quality connection to USB 2.0 peripherals.This 30-foot USB cable incorporates an equalizing chip, which enables it to perform beyond the limits of standard USB cables and communicate with peripherals up to 30ft away. 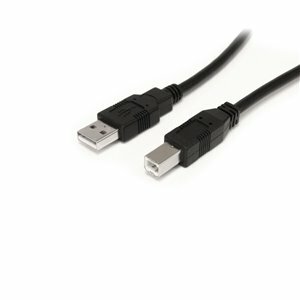 The USB2HAB30AC 30-foot USB A to B cable features one USB type-A (male) connector and one USB type-B (male) connector, providing a high quality connection to USB 2.0 peripherals. This 30-foot USB cable incorporates an equalizing chip, which enables it to perform beyond the limits of standard USB cables and communicate with peripherals up to 30ft away.